If you can find a driver whose superstitions don’t keep him away from the jungle an hour outside the Malaysian capital, Kuala Lumpur, and if can you climb a steep hill that pierces the canopy of trees, you’ll make it to the Dusun. It’s a resort that has become a regular stop for DJs and producers during their tours of Asia, which makes sense because the property is managed by a musician: Christian Schwanz (AKA Cee), one half of electronic pair Bass Sekolah. 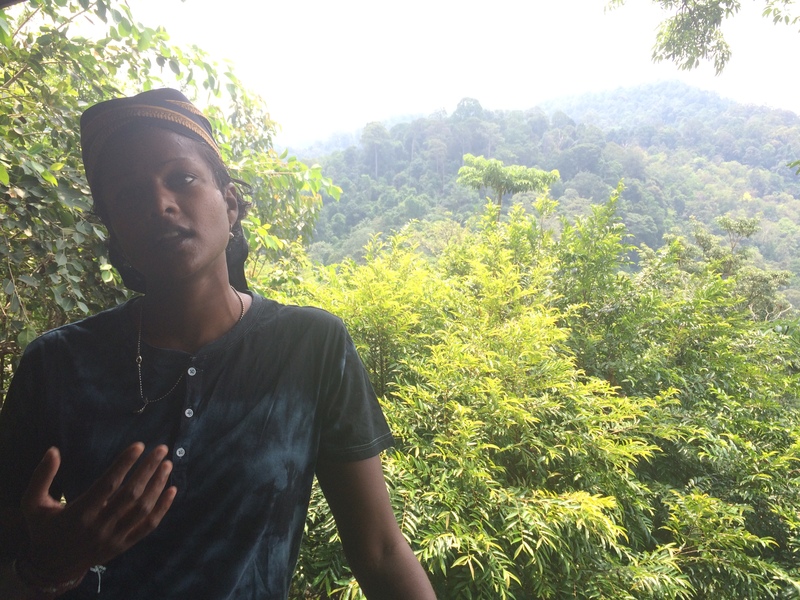 Visiting artists often get together on site to jam, and in May, recordings from some of these jungle sessions were collected and released as The Dusun Sessions. It features 11 collaborative efforts between Bass Sekolah and a roster of guest artists, including Berlin bass mystic Perera Elsewhere and LA beat scene whiz-slash-Brainfeeder alumnus Daedelus (aka Alfred Darlington). We sat down with the pair to talk about working with such unique environmental inspiration. 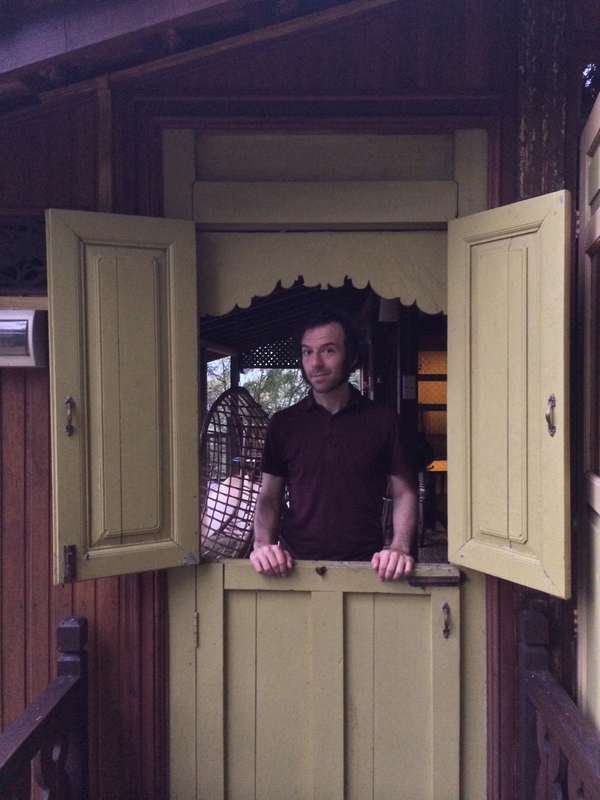 Daedelus: When we first got to this little oasis in the middle of the jungle, after touring for a while, it felt…”magical” is one word I would use. It’s incredible. Touring can be a grind. I don’t like to depreciate the idea of how much fun we can have as musicians on the road, and the touring life is not a bad life, but it’s really challenging, emotionally and physically. Every once in a while, though, you get the chance to be somewhere really special. Perera Elsewhere: I didn’t even go with the intention of recording. I was—as I think you were, Alfred—just on the way between dates. D: A lot times, when you’re gigging in Asia, you’ll only do weekends. Friday and Saturday are the big nights, so you have all this dead time in between where you can either go to the Dusun or try to do Shanghai for real. The truth is that Shanghai is not the easiest city if you’re not a local, and the Dusun is literally a paradise in the middle of Malaysia. So it’s an easy choice when you have a few days off. PE: I’ve been to Malaysia quite a lot in my life, and I think that, in a way, the Dusun could be anywhere. It’s like a bubble in the jungle where you’ve got some nice people and good food. D: The food roots it in Malaysia for me, for sure. When you’re eating all that beautiful curry with your hands, you have a feeling that you’re somewhere special. And I’m quite obsessed with coffee—my life outside of music is just trolling coffee places, which is a strange hobby. PE: So you went to that guy in the market, the one who sold you coffee? D: 100 percent. It was all butter-roasted stuff from this open-air fish and meat market. It was a beautiful space, though it smelled like fish and rank fruit. There’s one legit coffee vendor there, and he’s rad. But when we weren’t recording I’d walk around the grounds of the Dusun and find wild coffee plants. That’s extremely special, when you can pick a relatively ripe cherry off the tree. We also just played with the kids and the dogs and avoided snakes in the jungle. PE: Did you walk to the waterfall in the jungle? D: I did. It’s the kind of place where you can do all the normal resort things: just dip your feet in a pool and check out. I don’t know about you, but I felt the need to create in that space. It’s really evocative. PE: There’s also not a lot to do there, which is another reason it makes so much sense to make music. You’re in a beautiful place, and there’s so much sound anyway—jungle sounds, dog sounds, wind chime sounds, cricket sounds. D: Isn’t that the goal in general though? What else would you be doing in life if you weren’t making music? It’s kind of the dream. PE: And also, if you hang out with musicians, eventually you get bored of chatting and might as well make music, if not for any reason other than to pass time. D: It helped that there are no real walls in the resort; you’re just in open air most of the time. There are curtains occasionally, but that’s just to barely keep the sun out. You’re constantly buffeted with sounds, both from the jungle and the life around you. I’m used to being in a studio where sound is limited and you’re among your instruments. This is a different kind of creation. Your monitors are literally going into the jungle and you’re playing whatever is onhand. That’s the vibe. I would have made more music if I was more conscious about it, but I was only there for a handful of days. I’m excited to go back very soon and get my feet wet again. 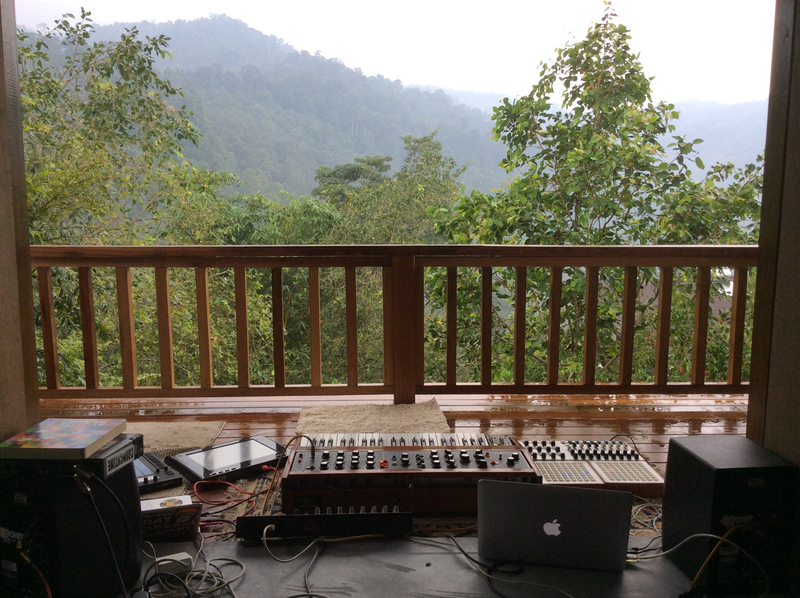 Perera Elsewhere’s setup at Dusun. PE: I personally really like making music outside a studio, like in my living room with the windows open. It’s the same whenever I go away. I’ve usually got a nice portable condenser mic and I use it to pick up a lot of outside sound. 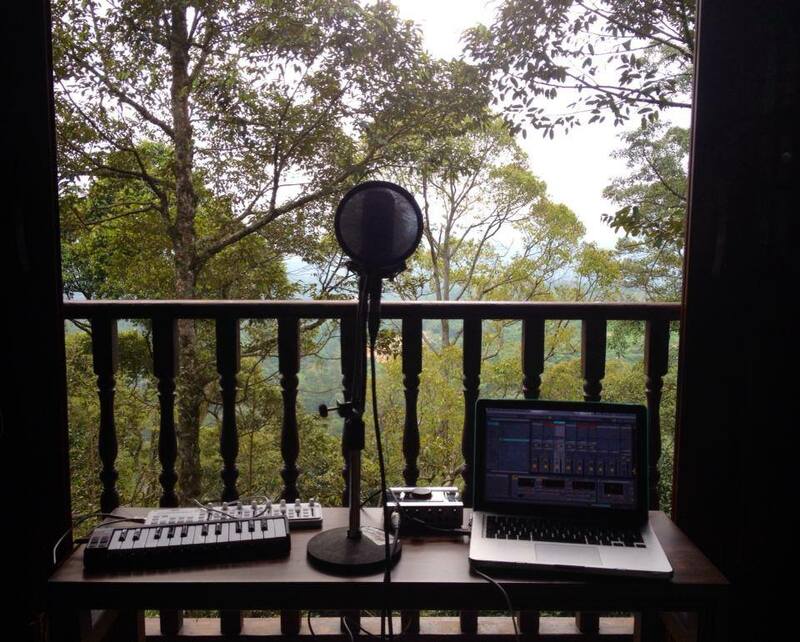 So for me, it’s not like [working with ambience] was totally new, but it’s just an amazing sound at Dusun. It was very suited to the way I work. D: For me, the room that has a sticky note, like a broken key on a piano that wants to be played more than others, leads to certain creative ideas. It just gives you a tonal or rhythmic base to work from, and that makes creation faster. PE: It gives your stuff its own imprint. If you’re working with plugins, anyone can make anything and it can sound super generic. Whereas when you start with your unique sound aesthetic leaking in, you don’t even have to bother doing that. For example, when I was recording “Polaris” in December 2014, I had the windows open late at night and it was raining violently. On the recording it sounds like a weird synth or an LFO or something, but it was actually a monsoon. There’s a connection between machines and nature, and you find that in a lot of ambient music as well. D: Atmospherics are huge, but I want to throw easy eating and the easy life into the mix. It’s funny that, when you’re well fed and feeling satisfied, sometimes music is the farthest thing from your mind—but at Dusun I felt [the need to make music] strongly. You would have a little breakfast or lunch and then move to the studio, and just let whatever was passing through you happen. There were little demarcations of meals during the day, but everything else was sound. There’s a lot of sensory activity overall—lots of scents, lots of sounds and lots of synesthesia, basically. PE: Looking back, the recordings are almost like a diary. On “Polaris,” for example, there’s a bit of a kid screeching that I time-stretched, and it sounds so spooky. I had gone upstairs to record and the sound just followed me. But we didn’t send [the tracks] back and forth and try to hammer them into something; it was an open and free collaboration. Some of the tracks feel very spacey and sketchy, and I think that’s cool. For me, they’re almost like a memory that I’ll look back on fondly, rather than a collaborative record where you just wanted to kill each other in the studio for ten months and then shat it out on the other side after much constipation. D: I’m getting a small window into your workflow here. PE: Sorry, I had to do a little monologue. D: No, I agree 100 percent. It’s not like [the record] has the clarity of a high-res file, a digital picture. It’s much more like a postcard, something I sent myself from the future. PE: That’s it man—a postcard. You got it.